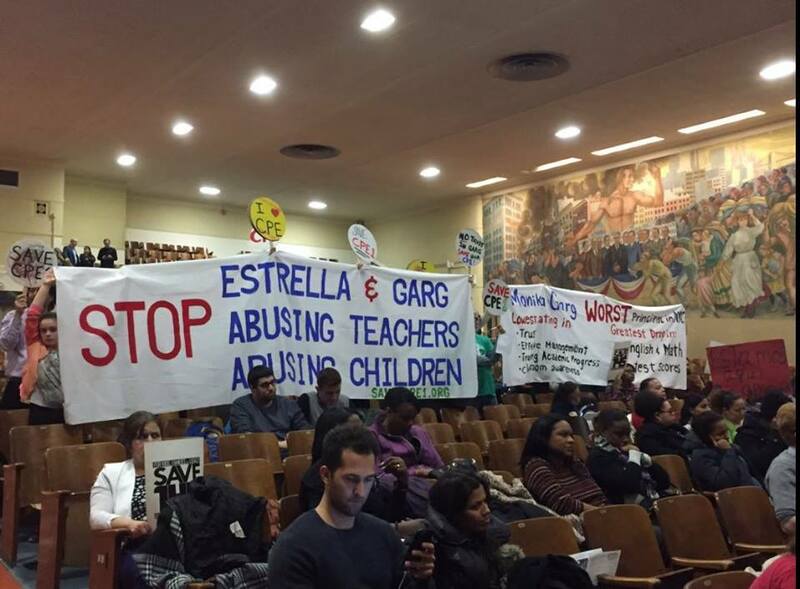 Abusive administrator Monika Garg has been removed as Principal of progressive Harlem elementary school CPE1 and UFT Chapter Leader Marylin Martinez and Delegate Caitlin Preston have both been fully exonerated of the retaliatory charges that Garg initiated to remove them to the school! This victory is the product of an eighteen-month struggle led by parents who occupied the school, took their children out of school in a family strike, and hounded Mayor DiBlasio at events. CPE1 teachers, supported by MORE representatives, repeatedly pressed the leadership at the UFT executive board for action. Read coverage in on the blog of MORE Executive Board representative Arthur Goldstein, the New York Times, and EducationNotes Online. Chapter Leader Marilyn Martinez will be speaking at MORE’s forum this Saturday at 3:30 PM – See details below… Please print this flyer to distribute to your staff today! Time: 3:30 to 6:00, with socializing to follow. President Trump, Congress, and the US Supreme Court are prepared to continue and escalate the attacks on the American labor movement, and national “right-to-work” laws will severely weaken public sector unions. How can workers organize in this environment, which is a result not just of recent events, but also of decades of anti-labor policy in the United States? How can public sector workers defend their unions from outside threats, but also hold them accountable and force them to stand up to Trump? Join MORE (the Movement of Rank & File Educators) at our forum on the future of public sector unionism; hear grassroots organizers from groups across the city share stories of their organizing work and their thoughts on how to prepare for the challenges of the future. *Speakers’ affiliations listed for identification purposes only. I hope you will join my new organization RODS- RESTORATION OF DISCIPLINE IN SCHOOLS. Goals are as follows: Establish military discipline in the public schools. Right of parents of well-behaved children to sue the parents of those students whose disruptive behavior prevents their child and others from learning. Fining of working parents and those on public assistance whose children persist in disruptive behavior. You’d see how fast many of these recalcitrant pupils would shape up. Restoration of corporal punishment in schools. Supervisors to give demonstration lessons with unruly pupils in the room. Referral of disruptive pupils immediately to Bureau of Child Welfare. Reestablishment of the 600 school concept for constantly unruly pupils. Reemphasizing vocational education. Union hierarchy to return to the classroom and teach under the conditions they have helped to create. E. Greenspan-retired teacher 33 years NYC school system. 19 years at IS 320 in District 17 and the remaining years at IS 228 in District 21. Survivor of worst NYC principal ever in system-Dr. V. Muhammad B.A., M.S., Brooklyn College Teacher of Social Studies Poem: Somewhere Next Term was read years ago at a symposium for poetry in San Francisco. Strong supporter of police. Strongly against BDS and other anti-Semitic . No longer spare the rod, but use the RODS! ROD also stands for Right-On-Discipline. Remember this basic fact in education: No child has the right to disrupt another child’s education.